In my quest to find out the truth about Aero Diamond, I got the official word from a Microsft manager who worked directly with or overlooked the codename “Diamond” project. Diamond was the codename for the Media Center functionality in Vista. Aero is the codename/feature name for the 3D desktop. Looks to me like someone jammed them together. Technically, Aero Diamond did not exist. Aero did, and so did Diamond, but not as Aero Diamond. So what this ATI presentation slide was referring to was only to the Media Centre experience. Someone along the way must have combined the terms Aero and Diamond to describe the UI in Vista’s Media Center, but that mislead many Vista community members. From that point onwards, people labelled Aero Diamond as an UI experience a tier above Aero Glass and began to speculate what it looked like. Of course, during the few years as a rumour, no one could ever discover what it looked like. This lead some to believe it was Microsoft’s secret theme for Vista, but no one could prove it. And now we now why. Aero will ship. Diamond will ship. Aero Diamond did not exist and will definetely not ship with Windows Vista. 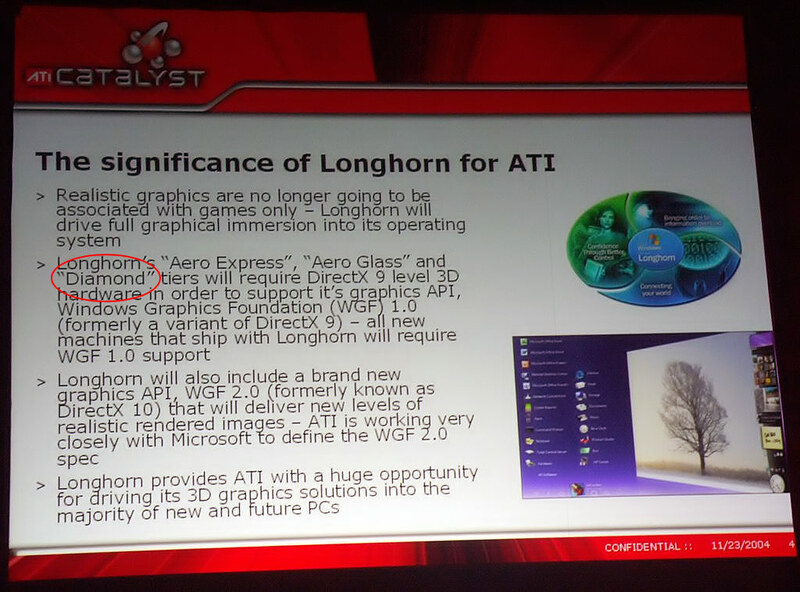 Update: In a later interview with Tjeerd Hoek, director of user experience for Windows Vista, details of a codename “Aero Diamond” were finally revealed. Whilst this does confirm the existence of an “Aero Diamond”, however it was never intended to ship with Windows Vista and basically describes a set of future UX concepts. What is this blog – a Microsoft PR stunt? What happened to the “I work for MS, yeah right” post? slap on the wrist from the pr department there? This blog post is entirely wrong and is making things appear as if they are facts, but the facts are that you truely have no idea what you are talking about. Very few people inside Microsoft know about Aero Diamond’s existence and even if whoever you spoke to WOULD and/or DOES know, they obviously couldn’t be honest with you about it. So get real and stop believing that Microsoft has to be honest to you, because they most definitely do not have any obligation to be. They wish to conceal this until they are ready to release it into the product and that is their stance on the subject. Like it or lump it, but that is how it is. great “weblog”! With the technical releases post RC1, it looks like MS are now scrambling to the fit-and-finish process prior RTM. I dont think they will have a secret tier above areo without extensive testing from the public. Just look at how many changes are made from user feedback based on areo alone. er… i think aero diamond IS the media center ui… or at least was supposed to be a really ‘pimped-out’ media center ui. i figure like a lot of other features, i just got dropped for something more familiar and simplistic. which is probably why media center still uses mce2005 screens and navigation controls, so as not to alienate/piss-off existing mce users. Pingback: hi-tech blog » Blog Archive » Codename Excalibur: Windows 7 MCE or Fiji codename prequel? It is a shame this isn’t actually happening. I can’t believe that this is not happening.